Train travel is an option that may not be favored by everybody, but when you compare it to flying, you will certainly get a lot more beautiful views when you travel by railway than you will high above the ground. Trains also provide a good way of getting from place to place without having to go through customs and the usual security checks. Not to mention, they usually provide a more relaxing travel experience than flying. On these train trips in Africa, not only will you get to travel between the country's destinations, but you will have some wonderful views to enjoy from the window as you travel. While the Blue Train may be the most famous train in South Africa, you don't need to pay the big bucks to enjoy this scenery, as the Shosholoza Meyl trains follow the same lines and are much more affordable and still perfectly safe. The iconic views of Table Mountain are just a part of the attractions here, with the beautiful wine region around the Cape offering some lovely scenery to enjoy too. This is quite a long journey that takes around seventeen hours when running on time, and reveals some of the fascinating culture around trains, with the vendors carrying trays of fruit and food on their heads at each stop. The route passes through some attractive scenery, with rolling hills and the greenery of the forests along much of the route. While it may not be the most modern of trains, it is certainly the best way to carry out this journey. This is a stunning line that follows the route of the Nile for much of the way, and the views of herds of camels, along with the stark contrast between the greenery around the Nile and the desert elsewhere makes for a visually stunning trip. The one hiccup with this route is that tourists cannot purchase tickets for the daytime trains at the station, only for the more expensive overnight sleeper train, meaning they either have to be purchased online in advance or purchased from the conductor on the train. This preserved railway has been running in the KwaZulu Natal National Park for over twenty-five years, and it is certainly one of the most interesting ways to see the superb scenery of this national park. 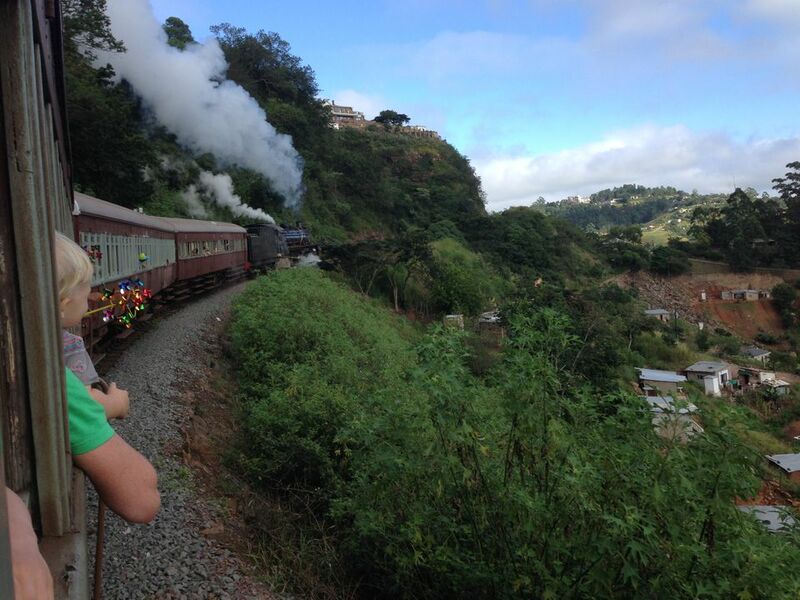 The train is pulled behind a historic steam engine and runs from the station at Kloof to Inchaga. There are some very steep sections along the line as it climbs through the 1000 Hills region, and you can really see the train having to work to pull the vintage coaches up the hills. There are few journeys that have such a contrast between the two destinations like this one, as you drop over five thousand feet from Nairobi in the mountains to the tropical heat of Mombasa, which lies at under a hundred feet above sea level. Along the route, the train passes through wonderful open areas, and it is common to spot giraffes, ostriches and impala and so many other species as you travel. This train runs with some historic rolling stock from the 1950s and does show some of the neglect caused by the economic situation in Zimbabwe, but the first class sleeping compartments are quite affordable for most international visitors. However, it is the experience that makes this route special, and as it is an overnight train, the sunrise as you travel across the plains towards the falls is sensational, and you can spot all kinds of wildlife while also seeing the spray of the falls rising on the horizon. This is a seasonal train that travels a stunning route through the Selja Gorge and includes plenty of wonderful views of the Atlas Mountains too. The train was once the property of the Bey of Tunis but has now been adapted to hold the tourists who flock to this line specifically because of the wonderful views throughout the route. Having originally been built to transport phosphates from these mountains, it now offers a very different service.